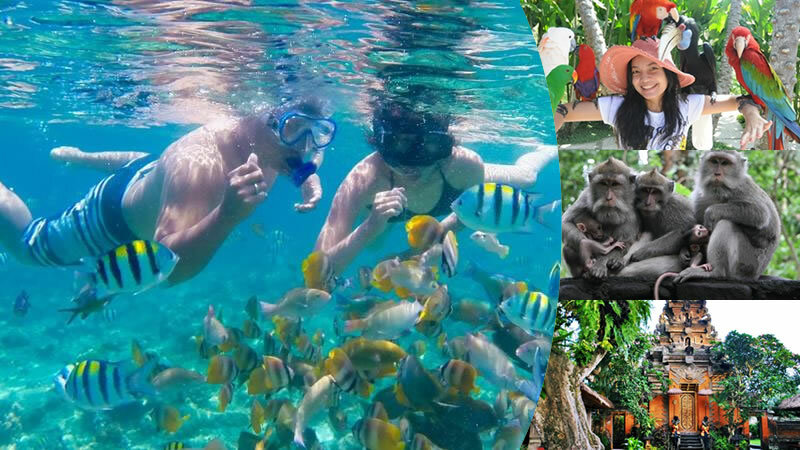 Tanjung Benoa Snorkeling with Bali Bird Park + Ubud Tour is one of our interesting watersport tour package where you will enjoy snorkeling activity at Tanjung Benoa beach then will be continued with Bali sightseeing trip by visiting Bali Bird Park, Ubud monkey forest, and also go to Ubud center for visiting famous Ubud Palace & Ubud Arts market. Don’t miss it and book your tour package only with us. This combination package tour will give you unique experience during your water sport in Tanjung Benoa Bali. 08.00 – Depart from Hotel. 09.00 – Visit Tanjung Benoa Beach for snorkeling & Visit the turtle conservation island with glass bottom boat. 11.30 – Having Light Lunch & soft drink. 13.00 – Visit Bali Bird Park. 16.00 – Visit Ubud Monkey Forest + Ubud Center with Ubud Palace & Ubud Arts Market. 18.30 – Transfer Back to Hotel. Swim wear, dry cloths, towel, sun block, sun glasses, camera and some cash or credit card for optional activities like jet ski, banana boat, parasailing and many more. A minimum 2 Adult (two) participants is required to join the tour. For single traveler additional 50% extra charge. Child from 3 - 12 years 25% discount. Infant under 3 years is free of charge. Private tour, means there is no other participant, just only you and your companion. “Bali Water Sport Tour” ? Please let us know which activities package you will choose. This price is valid for DIRECT BOOKING only. Not valid if you book through intermediary person.